The current State Government has not established community consent for a second casino on the Gold Coast and has no social licence to impose one upon the Gold Coast community. The core money-maker for casinos is poker machines. 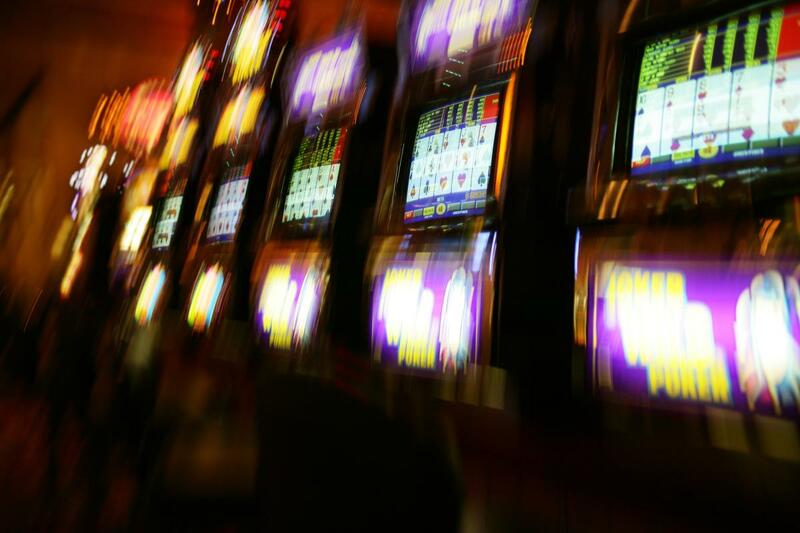 Recent estimates suggest that the Gold Coast is at saturation point for the number of pokies the community can sustain without greater social and financial harm to the community. "Las Vegas has always cast long shadows. After four decades of mob rule that ruined thousands of lives, the city is still dealing in unaccounted for untraceable money." At this time in the Gold Coast's history, when we are attempting to reposition ourselves as a safe and family friendly destination for residents, visitors and tourists, Las Vegas is not the model we should be basing our future on. A recent Tourism Australia Report 2020 survey of over 13,000 international tourists has revealed the 'Most Appealing Australian Attractions' to our international visitors. At the top of the list are: "Australian Beaches" at 53% appeal & "Australian Wildlife" at 46%. The post-Millennium trend with successive Queensland Governments (LNP and Labor) of inviting market-led approaches, especially on public assets, Crownland and public open space, is not an appropriate 'Government Policy Setting'. It is an absolute abandonment of Government Policy-Making responsibilities. Is Tourism Minister Kate Jones a willing participant in compromising the physical, social and psychological safety of Gold Coast children playing in the Broadwater Parklands or studying in nearby Southport schools? Does Jones have a desire to normalise gambling in the minds of children, young people and families through daily exposure to a casino in Southport? The International Gaming Industry has recognised that a new generation of potential gamblers will not be satisfied with the current 'boring' gaming-machine activities (aka pokies). The gaming industry is therefore developing and trialling gaming machines which carry the perception that skilled players can win, euphemistically calling this Videogame Tourism. The key advisor to the State Government's Tourism Minister, Kate Jones, appears to be David Edwards, Projects Chief Executive - Special Projects Unit in 'Tourism Industry Development'. Previously, Edwards was the Director-General in the Dpt. Of State Development under the Deputy Premier, Jeff Seeney, in the LNP State Government who offered over 100 hectares of public parks, islands and waterways on The Spit and Broadwater to the (now discredited) ASF China casino/ship terminal consortium. The Gold Coast City Council committed over $850,000 of ratepayers' money to commissioning two reports related to Gold Coast Mayor - Tom Tate's desire for an 'oceanside cruise ship terminal' on a public park and beaches on The Spit. The GCCC awarded the contracts to PWC an ASF China Casino consortium listed 'project partner', in conjunction with two other ASF 'project partners', AECOM and MacroPlan Dimasi. During a 4 year period from July 2013 to June 2017, expenditure on overseas travel by public servants through the Department of State Development in specific relation to the two new 'Gaming Licences for Regional Queensland' (a process initiated by LNP State Government in 2013 and continued by the current Labor Government) is in excess of $225,000 of taxpayers' money. The Gold Coast Community sees the era of multiple gaming-houses and casinos in our city (or anywhere in Queensland) as 'last-century 1980s' thinking for tourism and totally inappropriate in relation to current community expectations and values. The current Labor State Government and their LNP predecessors have never established a mandate or a social licence to inflict a second casino, aka 'Integrated Resort Development' (IRD), aka 'Global Tourism Hub' onto the Gold Coast community. And more specifically, during the 2015 election campaign and since being elected the Labor Government has been made well aware of the historical community opposition to Crown land, public open spaces or public parks being made available for cruise ship terminals or casino developments whether the location be The Spit, Broadwater, Southport or any other location on the Gold Coast. The term 'Integrated Resort Development' (IRD) was hijacked by the International Gaming Industry two decades ago. The 'Integrated Resort' business model is in fact a 'Segregated Resort' business model with the core business being gambling. The casino, hotel, apartment, retail, marina, hospitality 'resort' designs which the Gaming Industry push as IRD's are all located in the one privately-owned area/compound, and merely replicate and compete with all the existing local tourism activities and local businesses. These 'IRD' designs are engineered to trap and coerce the client/guest into never leaving the resort ('because everything you need is here') and thus a tourist's entire spend is within the one private resort. In the case of ASF China's SRD proposal on The Spit, one look at their consortium partners revealed that the emerging Chinese tourist market would pre-pay their package tours to ASF's casino-resort through a Chinese mainland-based company, 'Youth Travel Agency Limited' and fly on 'China Southern Airlines' to casino-owned shuttle buses, transporting guests/clients directly to the ASF SRD aka casino-resort. Guests would be segregated from all other local tourism, recreational, business, hospitality and entertainment activities. At best, a tourist information centre in the SRD may offer local tours or theme-park tickets but like the cruise industry, by garnering a huge commission from local businesses for signing up the ASF guests to take tours or to visit other local establishments. The Segregated Resort Development business model not only steals market share from existing local businesses and tourism operators but also monopolises the emerging Chinese Tourist market on the Gold Coast. The Gold Coast Community has now exposed the term 'Integrated Resort Development' as misleading and an attempt to conceal the core business of 'gambling'. In response, the International Gaming Industry has now invented an equally insidious PR-spin term, 'Global Tourism Hub' (GTH), as their euphemism for a 'Casino'. What is most evident with IRDs and GTHs is 'casino entrapment' where the client/guest is encased in windowless rooms and has no idea whether it is night or day, losing their interest in being outdoors or partaking in other healthier tourism activities. The core money-maker for casinos is poker machines. Recent estimates reveal that the Gold Coast is at saturation point for the number of pokies the community can sustain without greater social and financial harm to the community. So a new casino would have to operate their core business without pokies income or cannibalise pokies from existing, smaller institutions such as Gold Coast RSL, Sports, Surf Life Saving and Service Clubs. The President of the People's Republic of China has shut down the movement of large sums of money leaving China and declared that gambling in China and touting for casino customers in China are illegal. Consequently, the President has shut down the avenues for Chinese money-launderers, aka 'high-rollers', to use the International Gaming Industry and foreign casinos for their activities. Therefore, the business model has collapsed for 'high-roller casinos' such as James Packer's Barangaroo casino and the casino ASF were proposing for the Gold Coast. Packer is now asking for poker-machine licences to entrap local gamblers, so that he can make up for the 20-45% predicted loss in profits from the Chinese shut-down on money-laundering, high-rollers. Also, the Gaming-Casino Industry is becoming increasingly automated. In international casinos many of the jobs are now reduced to filling gaming machines and loading cards into mechanised card-dealers. These are not the 'Jobs for Our Kids' that we see as befitting their career aspirations. "Las Vegas has always cast long shadows. After four decades of mob rule that ruined thousands of lives, the city is still dealing in unaccounted for untraceable money." The Minister for Innovation and Tourism Industry Development, Hon. Kate Jones, recently returned from a trip to Las Vegas. In 2017, State Government officials and GCCC officials met or dined with a senior executive from Caesar's Palace Casino - Las Vegas, at a 5-star restaurant on The Spit while discussing a second casino for the Gold Coast. Likewise, the Las Vegas-based gaming company MGM International has also been in discussions with government officials regarding their interests in a second casino for regional Queensland. In recent times, these two Casino megaliths have displayed questionable financial and ethical records and behaviour. Caesar's has emerged from its $18 billion bankruptcy in the USA, filed under Chapter 11, having recently concluded a settlement with US Officials. And yet, Queensland Government and Council officials believe it is appropriate to conduct discussions with Caesars regarding a second casino on the Gold Coast? What about the probity issues regarding Caesars bankruptcy? In 2017, MGM Grand Resort - Las Vegas, was the site of the biggest mass shooting in the USA by a single shooter. Fifty-eight innocent people were murdered while attending an outdoor Country and Western concert and over 500 injured by a gunman holed up inside an MGM Grand Casino hotel room. The families of the victims and injured began a class action against MGM because the killer somehow managed to make approximately 30 undetected trips from his car to his hotel room carrying dozens of weapons and thousands of rounds of ammunition without raising the suspicions of hotel-casino security. The morally and ethically bereft MGM has now launched a counter-suit against the victims and their families to avoid liability under a dubious 'terrorism' legal loophole in a cynical exercise to string out and potentially sabotage the class-actions of the victims. How can Minister Jones justify discussions with these two gambling organisations let alone consider them as suitable for a second casino licence on the Gold Coast or anywhere in Queensland? 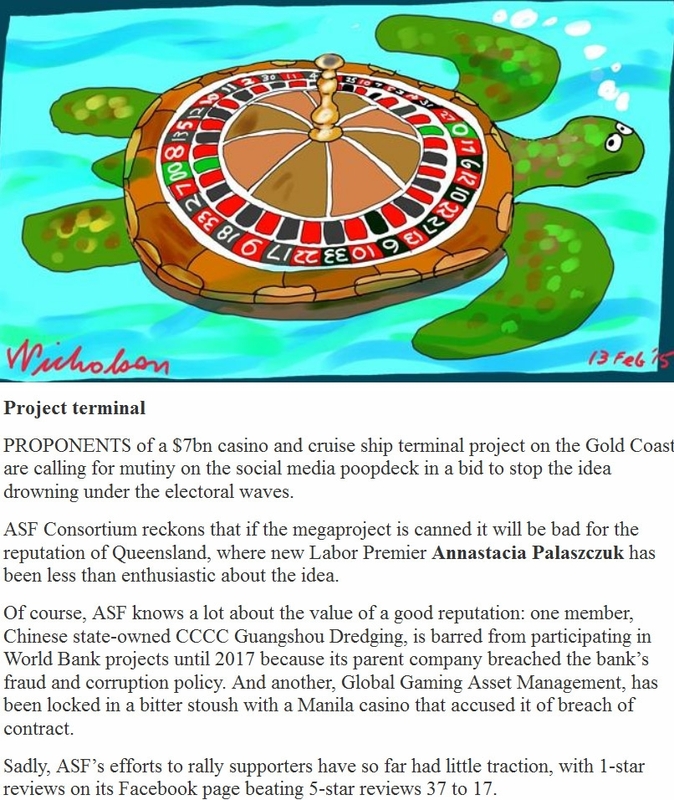 The ASF China Casino consortium was exposed for publishing wildly exaggerated jobs and economic figures for their Wavebreak Island casino/cruise ship terminal proposal, figures that were constantly parroted by the Mayor of the Gold Coast. They suggested that during construction there would be 36,000 jobs and 36,000 ongoing jobs once the casino and cruise terminal were operational, bringing $12 billion in economic benefits. And yet, one of the largest developments in Queensland's history, the Queens Wharf 'IRD' development in Brisbane cited only 2000 jobs during construction and $4 billion in economic benefit. So jobs and economic figures put out by foreign developers (and certain government officials) in relation to a proposed second Gold Coast casino are likely to be 'rubbery' or false. Moreover, the casino developers stalking the Gold Coast notoriously avoid quantifying how many new jobs will be created in comparison to existing jobs that will simply be redeployed to their project; how many local jobs will be created in contrast to interstate and foreign workers being imported; how many jobs will be short-term in contrast to ongoing permanent jobs; or distinguishing between the number of fulltime, casual or part-time jobs; or quantifying how much of the 'economic benefit' will remain in Australia, let alone the Gold Coast. Minister Jones is totally out of step with the International and Australian Tourism Industry with her focus on a second casino for the Gold Coast as a potential tourist attraction post-Commonwealth Games and at a time when we are trying to once again position ourselves as a sports, fitness, health, outdoor, nature-based, safe and family friendly destination for visitors and tourists. 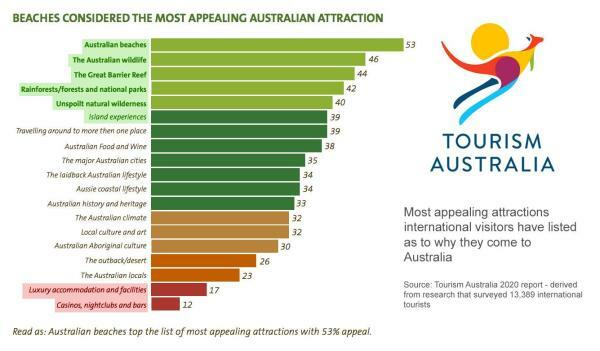 For instance, a recent Tourism Australia survey of over 13,000 international tourists has revealed the 'Most Appealing Australian Attractions' to our international visitors. Why is the Minister for Tourism ignoring the peak body, Tourism Australia, whose information and advice she should be heeding, particularly as their findings relate directly to the natural and human assets already available in the Southport, Broadwater and Southport Spit locations? Why isn't Minister Jones supporting ethical and innovative businesses such as eco & nature tourism, adventure/sports/fitness/health tourism, science and medical research and morally acceptable jobs such as Park Rangers, Botany, Marine Biology, Film-making, Coastal Management, Visual and Performing Arts, IT and Software Development, Medical Research, Bio-technology, Dive, Surf and Sail Schools etc. in her portfolio of Innovation, Tourism Industry Development and Commonwealth Games? 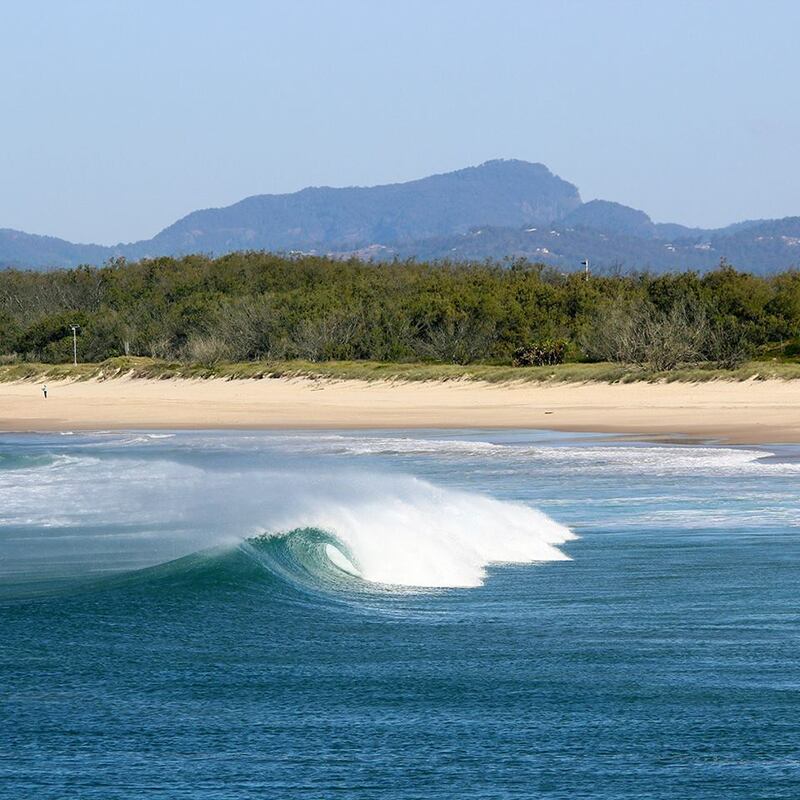 Minister Jones has stated publicly that the State Government is about to open a 'market-led approach' to private proposals for a Global Tourism Hub (aka casino) in the Gold Coast suburb of Southport. The post-Millennium fad with successive Queensland Governments (Labor and LNP) of inviting 'market-led approaches', especially on public assets, Crown-land, public open spaces and parks is not an appropriate 'Government Policy Setting'. It is an absolute abandonment of Government Policy-Making responsibilities. To give over the 'vision' and planning of Queensland's future to foreign, interstate or local entrepreneurs and developers, who are motivated almost purely by personal profit, self interest or greed, is an appalling way to administer good governance and can lead to monumental and irreversible failures in serving the interests of the citizens of Queensland. The ASF Consortium proposal was an example of the potential social, moral, ethical, environmental and economic disaster the 'Market-led Approach' brings to a community such as the Gold Coast. "You [state government] be in the market to know what a company wants to do. And then you find how you can fulfil their needs... So they do their thing in your place. You don't tell 'em what to do. They know what they wanna do"
Strano was the 'Special Advisor' to the Chief Executive Officer, David Edwards, of the 'Special Projects Unit' in the Dpt. of State Development (DSD) at the time of SOSA's meeting with Minister Lynham. This 'Special Projects Unit' was responsible for conducting the dubious ASF China casino process on The Spit and the design and implementation of the associated, highly-flawed 'community consultation' process in early 2017. Strano has previously come under the scrutiny of the Queensland Integrity Commission for his involvement in the contentious 'Berry Fruit Juice' affair in the Beattie Government era. Strano's attitude (and presumably Minister Jones') under the 'market-led approach' is to put public assets, public parks and open spaces such as Gold Coast beaches, islands, waterways, parks, open space and spaces of high community value on the Spit and Broadwater under enormous pressure to be privatised and/or commercialised. It also wastes public servants' time and tax-payer funds to be constantly put under pressure to assess a multitude of crazy (and often illegal) development ideas in contrast to the rare and occasional proposal which adheres to existing planning and environmental laws and community expectations and is proposed for privately-owned land rather than public land. Minister Jones' announcement regarding the opening up of the Gold Coast suburb of Southport to market-led approaches for a second Casino is totally contrary to the policies and planning strategies of previous Labor and LNP State governments and the GCCC who had earmarked Southport as a centre for Academia, Education, Health, Business, Science, Elite Sports, Research and IT industries. One location originally on offer was the State and Council-owned Broadwater Tourist Park. However, following a community backlash this site seems to have been taken off the list of potential Southport casino-sites, for the moment. Another potential location signalled to the International Gaming Industry by Minister Jones is Carey Park, a public park fronting the Australia Fair Shopping Centre, opposite the Broadwater Parklands. Carey Park is named after the Carey Family who established the first Carey's Corner Store in Southport in the early part of the 1900s. Much of Carey Park's public green-space was turned into extra car-parking to compensate for the loss of public carpark spaces during the construction of the light-rail through Southport. Repatriation of Carey Park to a green-space was meant to take place at the completion of the Commonwealth Games. Carey Park also borders the Queens Park Tennis Club, Southport Bowls Club and an ASF China development site. Minister Jones stated, "...we will make sure there is full community consultation as we move forward with this project." This sounds very much like the previous LNP State Government and their 'community consultations' for the (now discredited) ASF China casino proposal for The Spit when Edwards was Director-General of the Dpt. of State Development (DSD); that is, it appears that the Labor State Government will consult the community on what kind of casino we will get but not ask the community for our consent to have a second casino in Southport or anywhere else on the Gold Coast. Apparently the 'Community Consultation' process for the second Cairns casino licence was conducted from 20th December 2017 until early February 2018, when Cairns residents and businesses were flat out dealing with holiday-makers at a peak tourist time or on holidays themselves and not in Cairns. Carey Park and the southern Broadwater Parklands now live under threat of the negative impacts of a high-rise casino-resort and residential apartments in an era when the Community has repeatedly told all levels of government that no public parks, open space, beaches or waterways on the Gold Coast should be made available to or compromised by private or commercial interests such as cruise ship terminals or Gaming Industry interests. Carey Park is directly opposite one of the most popular family parks and children's playgrounds on the entire Gold Coast at the Broadwater Parklands. If Carey Park is offered as a Casino site it will physically and figuratively cast a dark shadow across the families and children who currently flock to this favourite area of the Broadwater Parklands. Southport State High School - "Independent Public School located in the heart of Gold Coast's central business district, Southport". The Southport School (TSS) - "Independent Anglican day and boarding school for boys "(P-12). St. Hilda's School - "Independent Anglican day and boarding school for girls" (P-12). "Education does more than prepare for the world of work and wages; it equips people to make decisions based on reasoned judgments and to live responsibly with the decisions they make" (Johnson, 1977). "There is increasing recognition that young people today are growing up in a world characterised by multi-cultural, multi-ethnic and multi-religious plurality. Many commentators contend that such rapid change, particularly within the western world, has resulted in societies with little social cohesion and a diminishing sense of common purpose and vision for greater community good." The collective values system, traditionally provided by the triumvirate of home, school and church has been replaced by a relativistic culture where 'anything goes' (Vardy, 2002). Has Minister Jones so lost her moral compass that she is willing to expose children and their families to the negative impacts of casino culture and gambling on a daily basis in Southport? Is Jones a willing participant in compromising the physical, social and psychological safety of Gold Coast children playing in the Broadwater Parklands or studying in nearby Southport schools? Does Jones have a desire to normalise gambling in the minds of young people through daily exposure to a casino in Southport? Or is she receiving bad advice and misinformation from senior public servants in her department? To further support the argument that a casino is the wrong industry for Southport, the International Gaming Industry has recognised that a new generation of potential gamblers will not be satisfied with current gaming-machines activities (aka pokies) because of their exposure to skill-based computer and online video games. "The demand for traditional gaming products is waning, and waning relatively quickly," warns Queensland's Commissioner for Liquor and Gambling David Ford. "Unless the industry can counteract that, gaming machines may well finish up going the way of bingo." When David Edwards was Director-General of the Dpt. of State Development (DSD) under the LNP Qld. 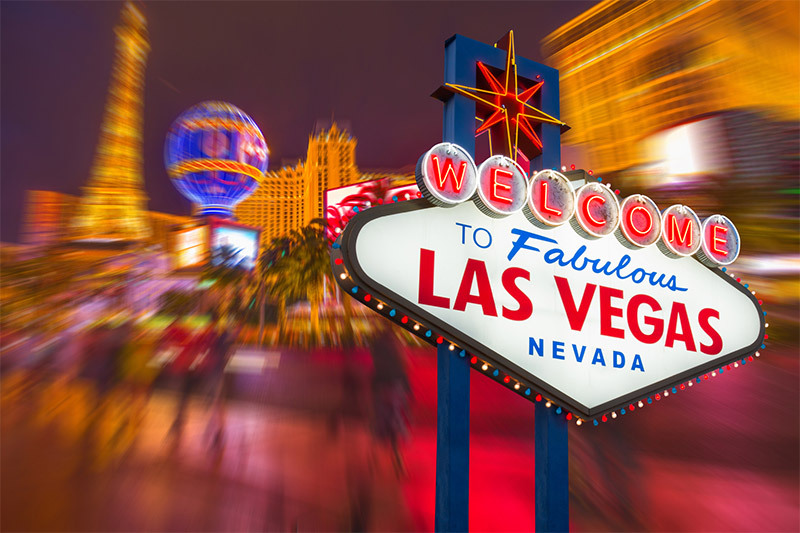 Government, DSD spent $22,121 of taxpayer funds sending two of its staff and Gaming Commissioner, David Ford, to Las Vegas during the 2013-2014 Financial Year on an "Integrated resort and casino sounding" trip. (DSD Overseas Expenditure Register 2013-2014). Victorian and NSW gambling regulators have received their first applications seeking to roll out a vastly new breed of poker machine - so-called "skill-based" gaming machines - which look and feel more similar to video games, determine payouts based on player ability as a well as chance, and are aimed squarely at drawing in Millennials... mixing an element of skill with a game of random chance might exacerbate an "illusion of control" punters feel they may have over the game. The pokies industry - [have] failed to find widespread appeal among younger people, who consider them mindless and boring... Jurisdictions in the US states of Nevada and New Jersey... have recently passed laws permitting the roll-out of the skill-based slot machines... beside the rows of ordinary slot machines at the world's biggest and best-known casinos run by the likes of Caesars Entertainment and MGM Resorts. Even for top-end casinos, revenue from pokies accounts for nearly as much as all the ritzy main-floor table games combined. The gaming industry is therefore developing and trialling gaming machines which carry the perception that skilled players can win and euphemistically calling this Videogame Tourism. This focus on 'videogame gambling' is a strategy to addict younger players and a new generation of gamblers who are currently not engaged in casino and pokies-based gambling activities in so-called, Global Tourism Hubs, aka casinos. In our opinion it is an unconscionable decision by Minister Jones to open up Southport to 'market-led' approaches to a second casino by private developers and the Gaming Industry right in the heart of local Southport family parks, children's playgrounds and schools when 'coincidentally' at the same time the Gaming Industry is developing gaming machines specifically targeted at the current videogame interests of those children and young people. The key advisor to the Labor Tourism Minister, Kate Jones, appears to be David Edwards, Projects Chief Executive - Special Projects Unit in 'Tourism Industry Development'. David Edwards is the son of Sir Llew Edwards who was the Liberal Party leader, Deputy Premier and Treasurer in the Bjelke-Peterson Government (1978-1983). David Edwards is also the uncle of Sam O'Connor, the current LNP Member for the State seat of 'Bonney' on the Gold Coast. Edwards was a GHD consultant to Santos GLNG, before taking up a position as a Media Advisor to the Qld. National Party. Edwards became Jeff Seeney's Chief of Staff while the LNP were in Opposition and then Seeney's Director-General when the Newman/Seeney government came to power in 2012. On a salary of $484,000 per annum, crikey.com.au questioned Edwards' experience and qualifications in relation to his appointment as Director-General of the Newman Government's Dpt of State Development, Planning and Infrastructure. HE COULD be the Newman Government's chief bureaucrat for corporate boxes. New figures have revealed David Edwards, the Government's hand-picked director-general of the new "department of grunt", has pocketed more than $6000 worth of tickets to sports and theatre events in the 15 months since being appointed. In March 2012, soon after the LNP success in the Queensland elections and one month before the GCCC election, Gold Coast Mayoral candidate, Tom Tate, a prominent LNP donor, met with the Newman Government to ask for State support to build a cruise ship terminal on the public parks, waterways and open space on the Gold Coast Spit and Broadwater. At the meeting was Department of Roads and Transport Director-General, Michael Caltabiano, Minister for State Development, Jeff Seeney and his Director-General, David Edwards. On 28 April 2012, Tate was elected Gold Coast Mayor. 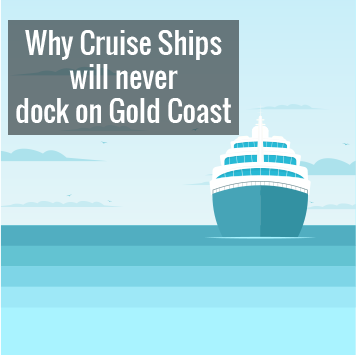 What followed was a Gold Coast City Council (GCCC) 'market-led approach' for the international development industry to put in proposals for a cruise ship port on the Gold Coast Broadwater and Spit. The successful proponent would be offered commercial compensation for constructing a ship terminal with permission to construct high-rise apartments, retail, hotels and private marinas covering 100 hectares of Crown-land, public parks, open space, islands, waterways, foreshores and beaches over most of the Gold Coast Spit and Southern Broadwater under the GCCC's Broadwater Marine Project (BMP) process. Eventually the GCCC BMP process was dropped and taken over by the LNP Government's 'Regional Gaming Licence - IRD' process to include a gaming licence and permission to construct a casino in conjunction with the other commercial developments in the original BMP framework. ASF China Consortium were miraculously chosen as the only 'possible proponent' for the project by the Seeney/Newman Government under the supervision of Seeney's DSD Director-General, David Edwards, a GCCC Officer (possibly Darren Scott) and the 'independent' probity investigators, PWC. Mayor Tate's friend and 'long term' lawyer, Tony Hickey, announced himself as Australian spokesperson for ASF and Hickey Lawyers as 'project partners' with ASF. World Bank debarment for ASF's major consortium partner, the China State-owned CCCC Guangzhou Dredging Co Ltd for 8 years from 2009 for 'bribery of local officials, fraud, corruption and tender price fixing' on Philippines National Road Projects. SOSA then investigated the LNP-appointed 'probity investigator' and learned that the PWC representative, Darren Black, who apparently headed the probity team and found no outstanding ASF probity matters, was at the time serving as the North Brisbane Regional Chair and on the State Executive of the QLD LNP. He was also a Committee Member of Infrastructure Queensland Association (IAQ) whose stated objective is to secure Government Infrastructure contracts for its private industry members. When QLD Labor won government in January 2015, having campaigned on the halting of the cruise ship terminal and private/commercial developments on Wavebreak Island and the Broadwater, strangely, and despite his history and background, David Edwards was re-employed by the Palaszczuk/Trad Labor Government in Dr Anthony Lynham's, Department of State Development (DSD). Initially, Edwards was appointed Director-General but then re-assigned to the role of Director of Integrated Developments (Casinos) and Major Projects which later became the DSD 'Special Projects Unit'. '...a binding agreement would be reached that any gaming licence granted would be conditional on the prior establishment and ongoing operation of a successful cruise ship terminal'. (Seeney to Tate correspondence - tabled in Parliament, 12th February 2014 - Hansard. In 2015, Minister Lynham's DSD issued a Request for Detailed Plan (RFDP) from ASF Consortium for an IRD on 6 hectares of crown-land on the Gold Coast Spit despite ASF no longer being required by the Labor Government to build a ship terminal. The first occasion that Min. Lynham appeared to have been made aware of the Seeney 'no cruise ship terminal, no casino licence' directive was when SOSA tabled it at our face-to-face meeting with Lynham and several senior public servants at Old Parliament House on 17th September 2015. Edwards was not present at the meeting. SOSA also mentioned to Minister Lynham that Edward's 'Special Projects Unit' was publishing misinformation on the Labor Government DSD website that ASF Consortium were chosen as the 'preferred proponents' for an IRD (aka casino) on The Spit. We pointed out to Minister Lynham that if ASF were eventually unsuccessful in being granted the tender/contract to build their IRD, and they perceived they were the 'preferred' proponents (rather than their true status as 'possible' proponents) there would be a sovereign risk that the State Government would have to pay them significant financial compensation. Meanwhile, ASF continued to misinform the Australian Stock Exchange in correspondence that they were 'preferred proponents' for the Gold Coast IRD project. How did the ASF Consortium become the Queensland Government's preferred proponent for the Integrated Resort Development?" The Labor Government eventually cancelled the ASF Casino proposal on The Spit in October 2017. In February 2018, the State Government paid ASF China Consortium a reported $9.1 million in 'compensation'. PWC, previously hired by the LNP Government as the probity investigators into ASF Consortium, became a major partner in the ASF Consortium the year following their probity investigation into ASF, headed by Darren Black. Subsequent to the PWC listing as a 'project partner' with ASF, Edwards received a 'gift' from PWC, the 'donor' being Darren Black, in the form of a lunch (value $70) at the PWC Boardroom on 22 October 2015. The reason given in the DSD Gifts Register for the lunch (July-Dec 2015) was to "network with allied professionals". ASF's major consortium partner, the China State-owned China State Construction Engineering Co. is responsible for 'nearly bankrupting the nation of the Bahamas' by not completing a $3 billion IRD project and walking away from the project with buildings incomplete and workers unpaid. ASF's major consortium partner, CCCC Guangzhou Dredging Co. is revealed to Minister Lynham (17/09/15) to be involved in constructing the Chinese Government's illegal (military) islands in the South China Sea. The April-June 2016 DSD 'Gifts Register' reveals that Edwards received a gift from CCCC Guangzhou Dredging Co of a "Chinese embroidered double-sided table screen" valued at "$100". Recipients of gifts are required to give, 'the reason the gift is a benefit to the Queensland community.' Edwards stated the gift to him was "to build goodwill and improves relationships relevant to department objectives." In April-June 2016, Edwards and Strano also received a dinner and lunch each from CCCC Guangzhou Dredging Co for a total value of $300 in prestigious restaurants in the Chinese city of Guangzhou to "build relationships with trade mission delegates." Following Tate's election to the Gold Coast Mayoral Office in 2012, Tate's campaign manager, Simone Holzapfel, was employed by the GCCC on 'major projects', including the GCCC's 'Broadwater Marine Project' and the proposal by ASF. Holzapfel left the GCCC and was appointed to the position of 'key strategist for ASF consortium' in September 2014, 'as it finalises details for its planned $7.5 billion Broadwater cruise ship terminal' (GCB 22/10/14) and casino-resort development. Edwards permitted a bogus community group named 'Better Our Spit' (no ABN or Qld Incorporated Associations registration) to set up a stall and hand out glossy brochures promoting the ASF proposal at the Labor Government's DSD conducted 'community consultation day' at Southport High School (26/03/17). 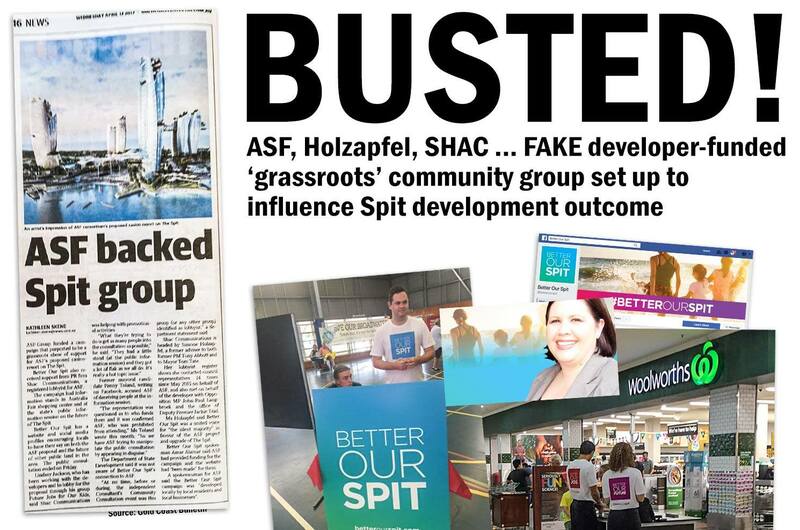 Community members attending the day, discovered that ASF Consortium had paid for the stall, printing and staff (one of whom one was the local Young Qld LNP President) through the PR Company and registered development lobbyist, Simone Holzapfel and her company, SHAC Communications. Edward's DSD 'Special Projects Unit' created and conducted the 2017 ASF IRD 'community consultation' process for a Spit casino with the exclusion of two major parks on The Spit (Philip Park and Muriel Henchman Park) despite the Premier having pledged that all the existing parks on The Spit would be a part of any community consultation for ASF's IRD proposal. SOSA surmised in an online article that that the DSD through the 'Special Projects Unit' had 'done a secret deal' to exclude Philip Park because Mayor Tate had ear-marked it for his 'oceanside cruise ship terminal' proposal (given the Labor Government no longer required ASF to construct a CST on The Spit to gain the second Gaming Licence on the Gold Coast). Following the publication of the article "Has Lynham Done Secret Deals with Tate?" and community complaints, the Premier's Office intervened to ensure the two parks were included in the consultation process. The company awarded the contract by GCCC (apparently without an open tender process) went to PWC - an ASF project partner - in conjunction with two other ASF China Consortium listed 'project partners', AECOM and MacroPlan Dimasi. The head of the PWC unit who conducted both the EPBC Act Referral report and the OCST feasibility study is Darren Black - the original ASF probity investigator. Only a heavily redacted 'OCST Feasibility Study' report has ever been released publicly by Council with the equivalent of 56 pages of the 286 pages missing, including the redaction of almost the entire 'Risk Assessment' chapter. The study cost the equivalent of $2797 per page. The GCCC committed another $10-12 million to 'further feasibility studies' by PWC and the other two ASF connected entities; however, Council officers claim further studies have been halted until the current State Government 'Spit Master Plan' process has been completed in late 2019. From July 2013 to June 2017, spending on overseas travel by public servants through the Department of State Development in specific relation to the two new 'Gaming Licences for Regional Queensland' (initiated by LNP State Government in 2013 and continued by the current Labor Government) is in excess of $225,000 of taxpayers' money. Of the nine overseas trips made by public servants to places including Macau, Singapore, Hong Kong, China, New Zealand, Las Vegas, Manila, 'USA' and 'Asia', David Edwards has travelled on seven of them. The above figures do not include Edwards' most recent trip (with another staff member from the newly created 'Special Projects Unit' within the Dpt of Tourism) to Las Vegas with Labor Tourism Minister, Kate Jones in June 2018. 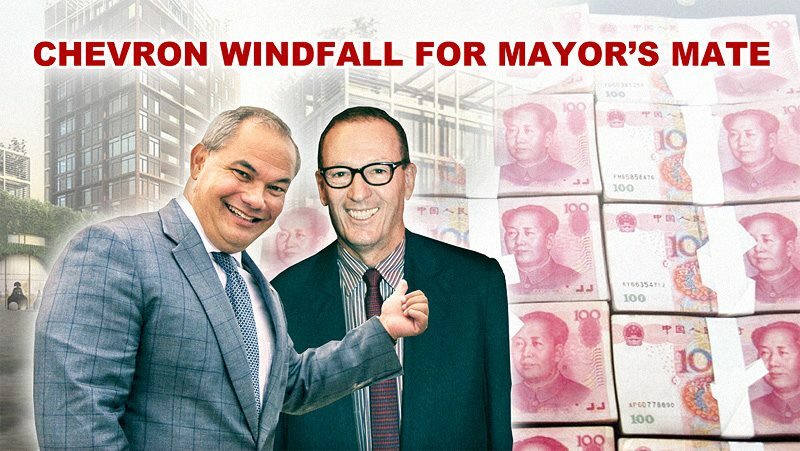 During the 2015-2016 financial year, at the height of the DSD push to allow ASF to build a casino-resort and highrise private-apartment development on The Spit, Edwards and his 'Special Advisor', John Strano, spent $23,102 visiting Hong Kong and China. It appears that Strano's name has since been removed from the DSD Overseas Travel Register for that trip, despite the CCCC Guangzhou Dredging Co's gift of $300 lunches and dinners to Strano and Edwards at exclusive restaurants in the Chinese city of Guangzhou still being listed in the April-June 2016 DSD 'Gifts Register'. On 14th February 2017, Edwards as a Labor Government senior public servant in the DSD, signed off on a 'gift' to ASF Group Director, Luis Chien (DSD Gifts Register Jan-March 2017). Taxpayers paid for Chien's dinner to the value of "$165"at the "Australia China Business Council Chinese New Year Dinner- Sofitel Brisbane." "Valuable networking opportunity with community, government and industry representatives." The very same day of Edwards' gift to the ASF Director, Luis Chien (14th February 2017), ASF Consortium Pty Ltd donated $13,200 to the Queensland LNP (ECQ Returns). While it is debatable whether Edwards enjoys exerting his influence over new (naive?) State Ministers, there is no doubt he enjoys the 'benefits' of operating from inside "Special Project Units" within various State Government Departments. It would be immoral and unethical for Minster Jones' and her chief advisor, David Edwards, to put young people and the financially vulnerable at risk given the proven negative impacts of gambling on the social, physical and mental health of those groups and individuals. In 2016, the 'biggest gambler losses per resident adult' in the World was Australia, well above Singapore, Ireland, Finland and the United States (source: H2 Gambling Capital). Minister Jones should be taking the 'Innovation' component of her portfolio more seriously and exploring it more broadly and in more detail. The State Government and Gold Coast City Council have not established a social licence to impose a second casino on our city and therefore do not have the consent of the Gold Coast Community to do so. The questionable behaviour of key Government personnel, private industry representatives, foreign companies and their history of various and numerous boardroom lunches, restaurant dinners, gifts, donations, overseas trips, undeclared party-political affiliations, flawed community consultations, redacted reports and dubious tender and probity practices, casts a huge shadow over the whole process currently surrounding the potential granting of a 'second casino' Gaming Licence for the Gold Coast. Rather than imposing a second casino on Gold Coast residents and the inevitable expansion of gambling culture among our young people, Minister Jones and her State Government colleagues should be supporting the building of strong communities based on the natural and human assets that already exist in the different neighbourhoods, suburbs and regions of the Gold Coast. Strong and united Communities take better care of the welfare, education, jobs and economic circumstances of their people than the Gaming Industry ever has and ever will. To believe otherwise would be WRONG.